Hello dear followers, today was a very gloomy day; really depressing and not good for nice pics! So here are some pictures I made a few weeks ago, on a bright and sunny day. Pictured is two coats of Beyu #325. To me, Beyu is a pretty unfamiliar brand, I've never heard about it from others or seen it on other blogs. Anyway, it has a modest but nice nail polish collection and next to polishes it also sells make-up. Among the nail polish collection are some regular colors (reds and pinks) but also a few quite interesting shimmer and glitter polishes and #325 is one of them. 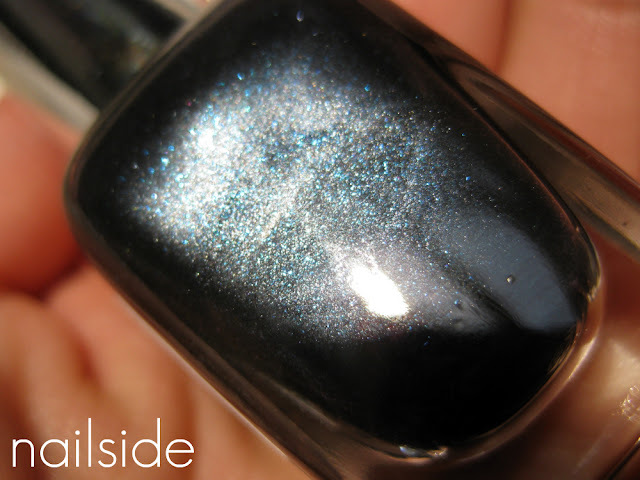 #325 is a dark grey shimmer polish with little, medium blue particles. Unfortunatey the blue isn't as noticeable on the nails as in the bottle, such a shame because it looked so promising! Despite of that I still like it. 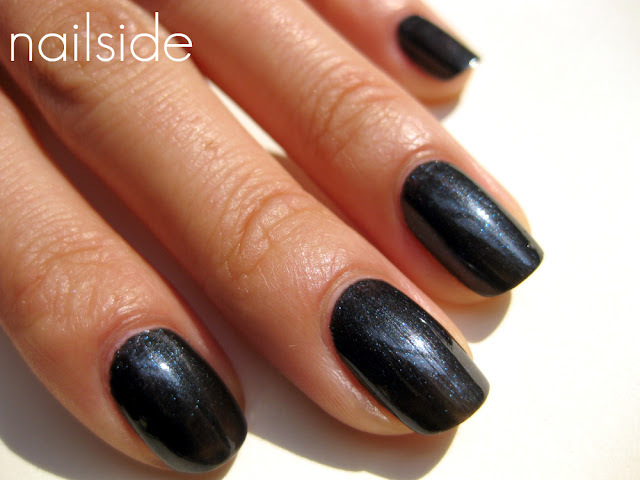 It's pretty unique and kind of edgy (and would look really gorgeous on short nails!). However, more of that blue wouldn't hurt :P So right after these pics I started sniffing around my stash for something blue to add on top. And how that turned out will be posted tomorrow! Hope you don't hate me now, hahah. Lots of pics! So I had to split it up :) So see you tomorrow! Beyu #325 was €5.95 for a bottle of 8ml/0.27 fl.oz. Super pretty color! So unique!